On our last Adelaide trip, we visited the Hahndorf Farm Barn which was minutes from where we were staying - we love the Adelaide Hills. This was our second visit at the farm, our first visit years ago was in full summer and the heat was not ideal for the barn activities, it got a bit too hot for the little ones. This time, we visited in September and it was nice and cold that morning so grandma's wooly jumpers and beanies came out in force! It was lovely inside the barn and great to cuddle up to the animals. Visitors can see baby and adult lambs as well as goats, they can hold and cuddle baby chicks, baby rabbits, baby guinea pigs and bottle feed baby lambs which was our favourite thing to do! After lots of cuddles inside the barn, we grabbed some mixed feed & carrots at the entrance and headed outside to feed the animals in the farm's wildlife park. We fed pretty much anything in sight ha! - the fawn, the kangaroos, the ducks, the goats, the geese and the donkeys and even tried to feed the cows and emus! On the other side of the barn, we saw some large pigs, numerous cows, goats, lambs and a camel. You can enjoy pony rides and tractor rides on the farm's purpose built tractor carriage several times a day during weekends and public & school holidays. Make sure you don't miss one of the two Farm Shows that take place every day of the week. The shows are lots of fun for the whole family and after the show you get to try your hand at milking a cow! There's also the interactive Wildlife & Reptile Show on weekends, public & school holidays. You can find the reptiles and wildlife in their enclosures at the farm entrance and can get up close and personal to lizards and pythons during the show! The addition of a playground is great for a play and ideal to enjoy a snack or lunch at the picnic tables while kids play. Also great for birthday parties. We had an awesome time at the Hahndorf Farm Barn, much more pleasant as the weather was cooler. A funny pic to finish up, don't worry they did enjoy themselves but refused to share their tractor with other kids so the grumpy defensive faces came out - ha! The Hahndorf Farm Barn is located at 2282 Mount Barker Rd in Hahndorf which is about 30 mins from Adelaide city. The Farm is open every day of the year except Christmas Day and Boxing Day from 10 am to 4 pm. Admission to the farm is $16 per adult, $13 for children 1 to 14 yrs, Free for kids under 5 and $47 for a family of 2 adults and 2 children. Get there by 11am for the Farm shows or 2:30pm every day or attend the reptile show on weekends at 12:30pm. Pony rides and tractor rides take place during weekends, public & school holidays. An extra fee of $5 per ride applies. Make sure you check that rides are taking place on the day you are visiting if the kids are keen to go on rides. There are toilets near the entrance on the right and free parking as you arrive at the farm. 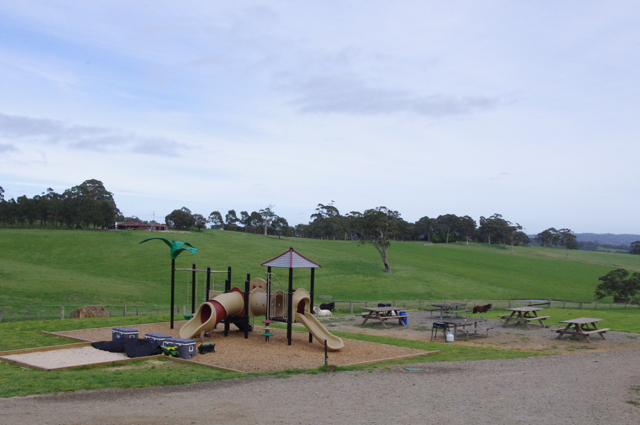 Busy City Kids were invited to the Hahndorf Farm Barn for the purposes of a review. All opinions & feedback are genuine & truthful. Travel, food and fee paying activities were self funded. For more information and up-to-date events news about the Hahndorf Farm Barn, head to their website.